In mid-November we headed over to Street-Level Youth Media, our (new as of January 2017!) multimedia center at North & Ashland Avenues, to hang out with a group of students from Vaughn Occupational High School who spend Wednesdays from 10-1 participating in a community-based learning initiative at Street-Level. 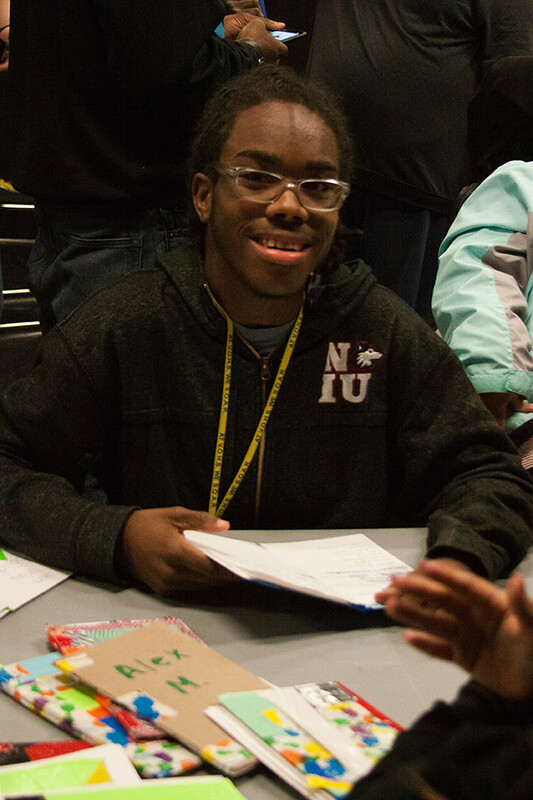 Vaughn, located in Chicago’s Portage Park neighborhood, provides a specialized education for high school students with cognitive, developmental, and multiple disabilities. Wednesdays at Street-Level present an opportunity for students to get out of the classroom and experience a unique learning environment in their city. During the nearly eight years that Vaughn students have been spending time at Street-Level, they have learned a variety of creative and multimedia skills in music and video. Each year they write lyrics, combine their individual lyrics into a collaborative song, and create a class recording. Past themes have included bullying, economics, and more; this year the theme is unity, and the word will be sprinkled throughout their final song in multiple languages. Check out images below by photographer Jess Leonard from November 15, when students worked with Street-Level instructor James Duke to scribe their lyrics in personalized journals (which they recently crafted at Street-Level) and practice recording their lyrics in preparation for their final song. The end goal? Helping each student develop and take pride in their own creative voice, and building a supportive and collaborative community. “My students and I have been collaborating with Street-Level Youth Media for nearly eight years. During our collaboration Street-Level educators have worked with youth with intellectual disabilities to compose, write, and produce hip hop tracks, audio pieces, and music videos. Since this program started I have seen my students reach levels that exceed all expectations. They have performed in several open mic events at Street-Level, staged live performances at two Mikva Challenge Civics Showcases, and performed at the Disability Pride Parade. They have written over a dozen tracks about socially important issues and created music videos for many of those tracks.